November 21st - December 12th, 2013: Through a reflective series, participants considered the transforming events of the fireball, the galaxies, life and consciousness through advent themes of anticipation and waiting, darkness and light, and the awareness that we are all one. 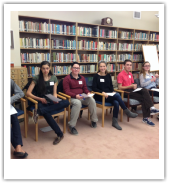 November 1st, 2013: As they prepared for an immersion experience to Guatemala, students from Bishop Allen Academy gathered for a day of reflection and learning of global citizenship and justice issues. 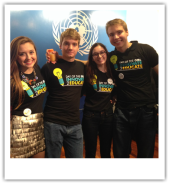 December 10th, 2013: Following their excursion to the United Nations, students came together to reflect on this experiences and discuss ways they might bring awareness of the work and goals of the UN to their schools and local communities. October 8th - 11th, 2013: On a three-day trip to the United Nations, high school staff and students had the exciting opportunity to take part in a course on justice and global citizenship. Highlights of the excursion included a tour of the UN, sessions on human trafficking, sustainability, Millennium Development Goals and attending International Day Of the Girl Child at UNICEF. October 2nd, 2013: The Loretto Sisters have a long history of helping refugees and recent immigrants settle into their new life in Canada. High school students from Loretto schools came together to learn about the work of the Loretto Sisters, and ways they can help fundraise for the Loretto Fund for the Angel Foundation for Learning. 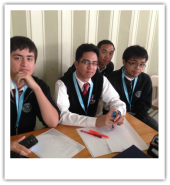 September 23rd, 2013: Students from St. Patrick's Secondary School (TCDSB) were introduced to both the IBVM and CSJ's Ministries as well as the "Companion in Spirit Program". 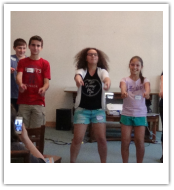 This program seeks to help students understand and apply agape in their schools and lives. 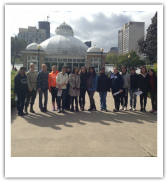 September 22nd, 2013: Loretto College residents prepared lunches for homeless individuals in downtown Toronto. 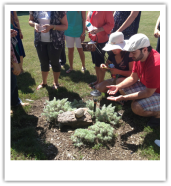 This experience included time for learning and reflection on the complex realities of poverty. Loretto Maryholme, a Spirituality and Ecology Centre owned and administered by the Loretto Sisters IBVM. 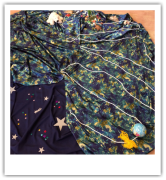 Activities included labyrinth and cosmic walks, and an introduction to sustainable gardening. 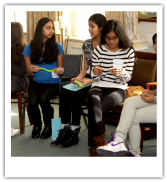 May 31st, 2013: Grade seven and eight TCDSB students were invited to talk about creating peaceful, positive and sacred interactions and relationships on Facebook, Twitter, Instragram and other social media outlets. 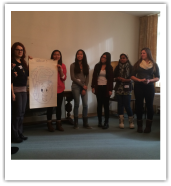 Students engaged with topics of online bullying and negative interactions, and discussed positive social media initiatives they could implement in their schools. 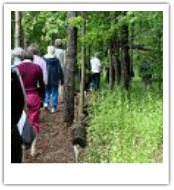 May 20th - 24th, 2013: Guided by Father Brian O'Leary, participants were provided with a deeper understanding of Ignatian Mysticism. Conference included a trip to Maryholme and workshops conducted by Arlene Ashack, Dr. Stephen Scharper, and Monty Williams. 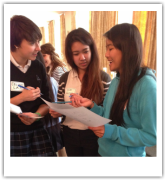 March 1st, 2013: This conference introduced students from Loretto schools students to The Earth Charter as a framework for justice work and action. 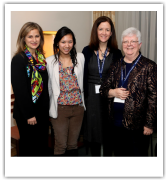 January 23rd, 2013: On January 23rd, Mary Ward's birthday, The Mary Ward Centre opened its doors to officially launch the Sister's newest ministry. Loretto Sisters, associates, staff, students and friends gathered together to celebrate the launch with opening remarks and a video presentation created in collaboration with students from Neil McNeil Secondary High School.